How-To-Guide Journey Book Set companion guide for adult volunteers [provides key information about this journey, its awards, and its leadership benefits, along with step-by-step sample plans for sessions with the girls. The adult guides also feature Girl Scout history, tips for getting out in the great outdoors, details about how to add your own "bells and whistles" to the journeys in partnership with girls, and unique activity sheets. 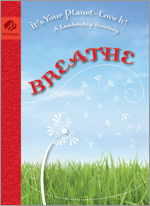 The Cadette Breathe and Adult Guide Journey Book Set is imported. Cadettes engage all five senses as they clear the air—their own and Earth's. Girls learn to assess air quality inside and out, getting an aerial view of everything from cigarette smoking to noise in the air to deforestation. Along the way, they try some scientific experiments (that could even double as magic tricks to share with Brownies). As they enjoy creating some "breathing room" in their lives, Cadettes may also find a new flair, think about "Hair," and perhaps even try making an éclair. After becoming more Aware, the girls go on to Alert others to act for air, and then Affirm their impact on Earth, as they add these three uplifting leadership awards to their collection of Girl Scout honors. Along this journey, Cadettes have the opportunity to earn three leadership awards that engage them in improving the world's air quality while also supporting and nourishing their own abilities as leaders who are aware, alert, and able to affirm all they do. Keep an Air Log throughout the journey. Identify two experts who can guide you to greater air awareness. Increase your AWAREness about the issues that impact Earth's air. Decide the most important, personal reason you care about Earth's air. With your Cadette team, choose an air issue to act on together. Decide whom to educate and inspire—this is your Air Care Team (ACT)! Decide what you will ask your Air Care Team to do. Decide how to reach your Air Care Team to inspire them to act on your air issue. Educate and inspire! Give your ACT its call to action. Gather proof of progress or improvement through your efforts to educate and inspire. Share the impact with your ACT and maybe even go further. Get with your Cadette team and reflect on your efforts and their impact. Affirm your commitment to strive to be an heir apparent of air and all of Planet Earth's elements. Girl Scouts has always had a tradition of older girls helping younger girls. In the It's Your Planet—Love It series of leadership journeys, Cadettes have air and Brownies have water. Think of the power of bringing these two grade levels and all their Girl Scout power together! That's what the LiA (Leader in Action) Award is all about. The LiA encourages Cadettes to be key assistants on a Brownie team's WOW! Wonders of Water journey. All the steps to the award are in the Cadette LiA letter found in the Adult Guide for both the Cadette and Brownie journey, and the downloadable form above.